Washington, D.C. – American Rivers today named the Buffalo National River among America’s Most Endangered Rivers® of 2019, citing the grave threat that a massive hog operation poses to the river’s clean water. American Rivers and its partners called on Arkansas Governor Asa Hutchinson to close down the Concentrated Animal Feeding Operation (CAFO) to save the river and its clean water for future generations. A 6,500-head hog CAFO, including massive indoor feedlots and two manure filled ponds, sits on a hill along one of Buffalo National River’s main tributaries, Big Creek, less than six miles from the mainstem of the river. Each year, millions of gallons of liquid hog waste are sprayed onto pastures and fields, some of which lie in the floodplain. Contaminants in the manure fields and ponds are having far reaching effects, including polluting groundwater wells and threatening endangered species. CAFOs are one of the largest sources of pollution to streams and waterways across the U.S., according to the Environmental Protection Agency (EPA). 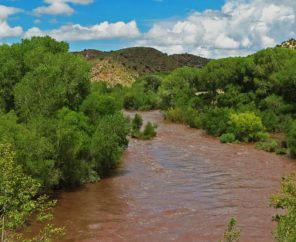 Following the listing of the Buffalo as one of America’s Most Endangered Rivers® of 2017, the state denied the permit for the CAFO’s operations and ordered it to shut down. Rather than comply, the owners have decided to fight the issue in court. American Rivers and its partners called on Governor Hutchinson to close the facility down and save America’s first National River. The National River designation should protect the river from industrial uses, dams and other obstructions that would impact fish and wildlife habitat. “If we can’t as a nation protect the country’s first National River, is any river safe from pollution?” asked local resident Teresa Turk with Ozark River Stewards. “Industrial-scale animal farming is a huge and growing threat to most American waterways. Our rivers will continue to get dirtier until corporations are forced to find safe and sustainable ways to deal with the massive waste that their animals are producing,” said Lin Wellford, a local resident with Ozark River Stewards. Winding its way through the forested Ozark Mountains of northwest Arkansas, the 153-mile long Buffalo National River flows through soaring bluffs, deep pools and gravel bars that lure millions of visitors annually from all over the world. People come to camp, paddle, hike and enjoy the river’s sparkling waters, vistas and clean air. In 2017, more than 1.47 million people visited the Buffalo National River generating $62 million in revenue and employing over 900 people in tourism related activities (e.g., cabins and hotels, restaurants, kayak/canoe rental). The Buffalo National River was previously included on this list in 2017. Other rivers in the region listed as most endangered in recent years include the Big Sunflower River (2018) and Pascagoula River (2016).